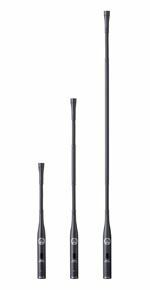 AKG's GN ESP Series gooseneck microphones feature a programmable mute switch to cover a wide range of applications including house of worship, conference, lectern and paging applications. All three versions can be programmed to on/off, push-to-talk or push-to-mute operation. Offering high radio frequency interference immunity, the GN 15 ESP, GN 30 ESP, and GN 50 ESP feature rugged construction and self-cleaning capsule contacts. Fully programmable, the GN ESP Series features hidden controls with jumpers inside to prevent users from unintentionally changing settings. The visible switch means users can activate the microphone only when needed, reducing the risk of feedback and improving intelligibility. Link has made enhancements to its eurocable line of ultra flexible Speaker Multicore cable specifically designed for the connection of multi-amplified portable systems. The new LK48N40AD2 48 conductor hybrid multicore continues the eurocable tradition of providing strength and flexibility for portable applications while maintaining exceptional electrical properties. The eurocable Multicore Speaker Cable Line includes configurations starting with 2 x 1.5sqmm conductors up through the new 48 x 4sqmm with 2 AES pairs. Audio-Technica's Engineered Sound line has been revamped to offer immunity to RFI, thanks to UniGuard protection in every model. The new ES microphones are also fully RoHS-compliant, and are available in more than 50 new models, for a comprehensive assortment of gooseneck, hanging, boundary, lavaliere, and handheld microphones. Other new features include the PivotPoint rotating connector on ES961 and ES961RC boundary microphones, off-axis rejection for improved gain before feedback, and an 80 Hz UniSteep filter for removal of unwanted low frequencies without affecting vocal quality. Four new interchangeable elements lend additional flexibility, with cardioid, hypercardioid, and omnidirectional elements offered, as well as the MicroLine. TV One's 1T-C2-511 converts HD-SDI to DVI-D and analog RGBHV. It also converts 525i or 625i SD-SDI to 480p and 576p respectively in DVI-D and analog RGBHV. The embedded stereo audio can be extracted from the SD-SDI or HD-SDI input. Any one of the eight available stereo channels may be selected and output in analog and AES3-id digital formats. Designed with the broadcast market in mind, the unit provides a reliable conversion with re-clocking and equalization of the input. HD-SDI HDTV resolutions from 720p to 1080i are accommodated. It can handle a serial digital video input up to 1.485Gbits/sec. The DVI HD output resolution matches the HD-SDI input. The 1T-C2-511 is housed in a desktop metal case and an optional single/dual rackmount kit is available. It can be operated from the front panel or an RS-232 connection. Active Thermal Management's Cool-stack II is a two rack-unit high hot air exhaust system. With six 120mm fans and an 18-inch depth, the Cool-stack II has the power--and the reach--to pull up to 130 CFM of hot air out of tightly packed racks while generating very low noise levels. The Cool-stack II has three temperature-controlled speeds, and is installer-programmable to switch between any two speeds as rack temperature changes. Programming can satisfy the requirements of both consumer and commercial installations; in either case, heated air can be expelled through the perforated front panel or through ports on the top or rear panels. Tubing and fittings are supplied with each Cool-stack II to channel hot air from its top and rear exhaust ports. The SoundPlus RX22-4 is the latest infrared receiver innovation to emerge from Williams Sound. The four-channel receiver will meet the growing demands of language interpretation, hearing assistance, and audio description needs in the commercial sound marketplace. The RX22-4's case design allows the infrared light to be received at all angles of the product. Coupled with sensitive infrared receptors, the RX22-4 provides for an almost FM-like experience. The four MPS models are complete multimedia presentation systems in a stand-alone box. Crestron integrated a 2-Series Ethernet control system, multimedia switcher, audio amplifier, balanced audio with professional DSP, mic inputs, discrete touchpanel preview out, and full QuickMedia signal routing and processing. Complete functionality with front panel control, plug-and-play connectivity with Crestron interfaces, and links to RoomView remote management software, MPS systems deliver a cost-effective presentation solution. For added functionality MPS systems offers seamless plug-and-play connectivity with Crestron 3-channel amps, touchpanels, keypads, handheld remotes, iLux lighting control, and the new APAD room controller. beyerdynamic's Revoluto line array microphone station provides sound reproduction without the use of a gooseneck microphone. The microphone capsules in the Revoluto create an omnidirectional pattern allowing the speaker to move around without affecting the volume or sound quality. Due to its multi-capsule design, the Revoluto provides additional redundancy with no loss of pick-up. The Revoluto station is available in three versions, Basic, Standard and Graphic. Lightronics' XC Series line of compact dimmers have a new look and are features, including wireless DMX option, an LED digital display, four and six channel capacity, 600 and 1,200 Watts per channel, Softpatch (each dimmer), dimmer limiting, dimmer curve/relay selection, DMX-512 protocol, built in chase function, "set and forget" intensity, architectural interface, and AMX/Crestron interface. The XC Series, as well as all Lightronics products, is covered by a full five-year warranty. Bosch Security Systems' AutoDome Easy is a compact PTZ camera designed for discreet video surveillance in mid-sized indoor applications. The newest addition to Bosch's AutoDome family, the AutoDome Easy combines a high performance pan/tilt unit and an autofocus zoom camera in a compact, vandal proof housing to offer a new, cost-effective alternative that bridges the gap between fixed minidome and traditional high speed PTZ dome cameras. The AutoDome Easy is particularly well suited for discrete surveillance applications, such as small retail, education, and corporate settings, because of its compact size and vandal-resistant housing. The Bosch AutoDome Easy provides a high degree of flexibility, with 60 user-defined, preset positions as well as four autoscan modes and four preset tours. Tecom Electronics' TechPod now has a new interactive screen, making it a writing board even for maps and medical applications. This allows users to clearly annotate their material for the audience without stepping away from their TechPod lectern. Fully protected by the lectern's tempered protective glass, the interactive screen is more sensitive to the new TechPod pen. In addition, Tecom has added other enhancements, including a new AV controller, for faster transitions between media; improved two-way loudspeakers supplied as part of the solution, and more. BTX's next generation of solderless connectors, the new MaxBlox EZ termination system, allows installers to terminate an HD15 or a DB9 with just a screwdriver, and mount it in a panel, plate, or MaxBlox hood in a fraction of the time it would take to solder. When used in conjunction with the MaxBlox CD-MX159H hood, these connectors slide, snap, and lock into the hood without the use of tools. Optimized for use in any AV application where VGA or RS-232 controls are used, the HD15 and DB9 connectors are manufactured by BTX with Phoenix Contact terminal blocks. Danley Sound Labs has added the SH-DFA down-fill loudspeaker to its SH Series. This new asymmetrical full-range horn integrates with the SH-50 loudspeaker series. The SH-DFA fits the exact footprint of the SH-50 and is only 9 inches high, with a coverage pattern of 50 x 100 x 50. Designed to maintain considerable pattern control due its depth makes the SH-DFA a problem-solving product. All the models in the SH Series are high-output, fully horn-loaded, loudspeakers that perform well without the need for additional, expensive signal processing. The SH-50 technology amalgamates two Danley Sound Labs technologies, the Tapped Horn and the Synergy Horn, both patent-pending designs, for low-frequency pattern control, audio quality, arrayability and low-frequency extension. Each model is also available as a powered option using Class D audiophile power and on board DSP. The MAX 4300-PM power conditioner offers advanced circuitry for the protection of sensitive home theater components from damaging power surges and transient voltages. Automatic Voltage Monitoring (AVM) constantly monitors the AC line for unsafe voltage conditions such as prolonged over-voltages and under-voltages, while linear filtration technology (LiFT) and isolation between outlet banks reduce performance-robbing AC noise for clear, detailed images and crisp sound. Additionally, the MAX 4300-PM offers a USB charger and gaming LAN convenience outlet on the front. With a high brightness rating of 500 cd/m2, the Mitsubishi's LDT421V 42-inch WXGA LCD monitor works in any venue where bright ambient light can cast a reflective glare on the monitor surface and diminish the display itself. With the matte surface of Mitsubishi's LDT series of monitors, the video displays can be seen through windows with minimal glare. The LDT421V has a full range of professional AV connectivity for maximum integration flexibility and its own scheduling controls for easy planning of on/off operation, presentation timing, image changeovers and more. Accessing menus and control information through the RS232c connector is easy and efficient. Mitsubishi's monitors can also be networked using third-party solutions. Radial Engineering's Radial Convertible V12 is a modular snake system that offers up to 64 channels in a mere 12 rack-spaces. The modular design features a "rack inside a rack" whereby the system engineer can design and format the snake to suit his needs and make changes as his requirements evolve. The modular design allows complete freedom to chose multipin format, transformer and patch requirements, and is supported with both color and alpha-numerical coding for easy of deployment. Dotworkz's D2 extreme environmental housing provides heavy-duty protection to PTZ dome cameras from the rigors of outdoor use and physical damage, along with the convenience of the industry's largest on-board component mounting space. The D2 is compatible with 99 percent of analog and IP PTZ cameras. Water- and air-tight, the D2 assures cameras are kept within proper operating temperatures. Available standard equipped with a heater/blower good in temperatures ranging from 30 degrees to 95 degrees, the D2 is also offered with either the Dotworkz Ring of Fire cold climate system for areas that reach below -20 degrees and where ice/snow commonly collect, or with the Dotworkz Cooldome thermo-electric cooling system that protects the system up to 145 degrees. Polycom's RMX 2000T real-time media conferencing platform delivers high definition continuous presence conferencing with full transcoding on the existing RMX 2000 media processing module hardware. The feature, delivered with RMX 2000 version 2.0 software, enables customers to combine video conferencing endpoints with different resolutions within the same call, showing multiple sites simultaneously, and providing optimal resolution and call quality for each participant based on the capabilities of their video system. MagicBox's Memo is an IP addressable messaging system, which supports composite, S-Video, and VGA outputs at 800 x 600 and 852 x 480 resolutions. The primary markets for this system include cable and satellite TV, along with digital signage applications requiring an EDTV resolution on large screen displays. Memo Composer Software, which is bundled with the system, allows the author to create content and publish it via network or USB drive to the player. Several options will be available including project preview, live weather statistics, background expansion packs, and emergency blast. Hall Research Technologies (HRT) has developed two new closed captioning (CC) decoders with text overlay capabilities for the digital signage market. These units can capture closed captioning text (CC1 through CC4) and overlay it on the video output. The units can also display user-defined text anywhere on the screen either played back from memory or received through a serial port in real-time. Both units provide composite and S-video inputs and outputs; the CC-101-PRO version also provides PC (VGA) video as well as progressive component video (YPbPr) outputs. Leon Speakers' Profile Series is a reference-grade line of on-wall speakers designed to deliver exceptional audio combined with unparalleled aesthetics. The Profile series speakers feature a choice of dual 4-, 5-, or 6-inch paper cone woofers with solid milled aluminum phase plugs and factory matched 1-inch cloth dome tweeters in bass-reflex enclosures built from 3/4-inch solid MDF. All Leon speakers are custom finished to precisely match the dimensions and finish of every brand of flat-panel display available. ProRack House and Monitor small-format mixers from APB-DynaSonics incorporate an array of features, 16 total input channels in 10 rack spaces. Both the ProRack House and Monitor mixer feature an audio design that includes minimum phase-shift circuitry, expressive EQ sections and integrated mic preamplifiers in a proprietary front end circuit. The ProRack House has 12 mono input channels and four dual-mono/stereo input channels; while the Monitor is fitted with 16 mono input channels. The mono input channels of each model share the same Input and EQ circuitry and controls: 48 volt phantom power switch, mic/line switch, mic pad switch, and polarity reverse switch. Variable frequency high-pass filters are included on all input channels (mono and stereo) with a 20Hz to 400Hz sweep range at a 12dB per octave attenuation rate. The FiberPlex LightViper VIM-MY32 mini-YGDAI interface components are designed to allow owners of Yamaha digital audio production consoles to connect direct via fiber to the LightViper fiber optic audio "snake" system. A pair of rear-of-console, plug-in VIM-MY32 card modules (master and slave set) will handle 32 audio sends and eight returns (24-bit/48 kHz digital audio) via LightViper's fiber-optic digital audio cable. By adding an additional VIM-MY32 card set, the Yamaha PM5D console can operate with 64 sends and 16 fiber optic returns. Various combinations of LightViper MY-32 cards can be used in concert with Yamaha's PM5D, M7CL, DM2000, DM1000, and the new LS9. With the exception of one external interconnecting jumper between each master and slave card module set, no additional cables or rack mount electronics are required to interface a LightViper fiber optic audio snake. The DVI Sniffer from Altinex is a pocket-sized device that allows installers to measure the quality of a DVI signal at each connection point in the run. A six-level LED bar displays the strength of the DVI signal: level one indicates the DVI signal is very weak and cannot be recovered; level six indicates a full strength DVI signal. Just plug the cable or device into the DVI Sniffer and it will show you if the signal quality is good, marginal, or poor. The DVI Sniffer has an auto shut-off feature to preserve battery life and cannot be turned on accidentally in your tool box. Lutron Electronics' Sivoia manual shades share hardware with Sivoia QED roller 64 for conversion from manual to electronic control, maintaining the system's quiet operation. To convert the Sivoia manual shade to a Sivoia QED electronic shade, just pull off the manual clutch and insert a Sivoia QED roller 64 drive. With the ability to convert to electronic control at any point in a project, designers can specify and install one set of hardware and then adapt it to manual or electronic control, depending on the user's needs. Pre-wiring for electronic shades provides ease-of-installation when Sivoia manuals are converted to Sivoia QED electronic shades. NextWindow's 2400 Series touch screen overlay with optical imaging technology can turn any 32-inch to 65-inch plasma or LCD into an interactive display, with full mouse functionality, using only fingertip touch. The 2400 Series design and HID compliant USB interface provide plug-and-play connection with no proprietary drivers to install. The NextWindow 2400 touch overlay utilizes optical imaging technology to provide a responsive, durable touch solution suitable for high-traffic, public applications, including information kiosks, interactive whiteboards, and digital signage applications. The NextWindow 2400 Series is an overlay designed to fit over a standard monitor enclosure, it mounts quickly using adjustable tension straps. Kramer Electronics' VP-419xl scaler is a desktop-sized video to computer graphics video and HD scaler. Two units of the VP-419xl can be easily rack mounted side by side for professional system use with the optional RK-80N rack mount adapter. The VP-419xl will accept an NTSC video signal in composite video, S-Video or component video format and will up convert that signal to one of eight computer graphics video and HDTV output resolutions. The unit also has a 15-pin HD computer graphics video input that when selected, or when the unit is powered off, will be routed directly to the output. The computer graphics video output resolutions available are VGA, SVGA, XGA, and SXGA. The VP-419xl packs high performance scaling into a compact desktop sized package. The unit has per-pixel motion compensated de-interlacing for artifact free images, automatic detection for 3:2 pull-down for 24fps material and a vertical temporal filter to remove jagged artifacts. Allen & Heath's XD-53 professional monitoring headphones complement the company's Xone DJ mixers. The XD-53's incorporate a circumaural isolation design, providing high-level isolation from ambient noise, making them the ideal product for DJ's requiring immersive listening in loud environments. Comprising 53mm diameter drivers, with high power neodymium magnet design, 1500 mW of power handling, and high SPL capacity, the XD-53 headphones deliver excellent sound reproduction. They also have rotating earpieces for easy one-ear monitoring, a coiled cable with convenient one-side exit, and a folding design for compact portability. D.A.S. Audio's Reference Series sound reinforcement systems consists of two 12-inch models, two 15-inch models and two double 15-inch models available with one-inch and 1.5-inch compression drivers equipped with titanium diaphragms. Included in the range of externally powered products are two subwoofer systems boasting a single 18-inch bass-reflex configuration and a high power double 18-inch system for use in applications requiring the extra low-frequency power. All new rotatable horns with 80-degree x 50-degree and 60-degree x 40-degree horn dispersions offer precise coverage and control whether the cabinets are used in either the horizontal or vertical position. A new grille design, which is internally lined with acoustically transparent filter cloth, protects the speaker components from impact damage, dust, and the elements. Panasonic Projector Systems' PT- DW10000U three-chip, DLP projector provides bright images, automatic filter cleaning systems, and improved reliability features. The PT-DW10000 also features Panasonic's dynamic iris that helps produce the projector's 5,000:1 contrast ratio and reveal more detail in both dark and bright images. The PT-DW10000 also includes 10-bit video processing for smoother tonal expression. A 3-D color management feature helps optimize color saturation, hue, and brightness levels for approximately 1,070,000,000 colors. The PT-DW10000U model also includes several key performance and reliability features. A new liquid-cooling system directly cools the DLP chips and allows the projector to be used in temperatures up to 113 degrees, for use in a wide variety of environments. The PT-DW10000 also features the auto cleaning robot, an automatic filter cleaning system that enables about 2,000 hours of use without filter maintenance. The Custom Builder Series drastically improves upon every aspect of Speco Technologies' entry-level speakers. A mineral-filled polymer woofer cone improves the sound and lessens distortion. The baskets have been custom tooled and the sound professionally tweaked for peak performance. A titanium anodized cone perfects the tweeter sound. The tweeters will swivel in a specially designed cradle that eliminates any diffraction. Furman's Reference i-Series Power Conditioners feature smooth contours of black steel and silver brushed aluminum complemented by clear blue LED lights. In addition to the technologies included in the original Reference Series, such as discrete symmetrically balanced power, linear filtering Technology (LiFT), and non-sacrificial surge suppression, the IT-Reference 15i and IT-Reference 20i have been optimized with dual screen technology, which provides over 30 percent greater noise reduction capabilities. Westinghouse Digital Electronics is entering into an exclusive arrangement with AdtekMedia to accelerate the national expansion of PumpTop TV, AdtekMedia's premier digital media network. Westinghouse Digital will build and install turnkey display systems for fuel pumps serviced by AdtekMedia's narrowcast network, which will deliver news content and advertising to gas station consumers as they fuel their vehicles. The Westinghouse commitment involves supplying complete systems to be installed onto thousands of gas station pumps in each of 60 of the largest U.S. markets. PumpTop TV brings the power of television to the gas pump and captures the attention of consumers in an engaging five-minute program of news, sports, entertainment, weather, and traffic interspersed with advertising. TechSpa's Announcer telephone paging system can be expanded per the application's requirements, works on any commercial/industrial rack-mounted or desktop PC and easily interfaces with multiple phone lines via the proprietary modem and soundcard. The simplicity of the Announcer GUI is derived partly from the expandable control feature sets, which can be customized for any specific application by TechSpa technicians prior to installation and expandable thereafter by the integrator. TechSpa can configure and ship the Announcer paging system as a standalone software package, or as a pre-installed package on a commercial/industrial rack-mount computer so the integrator doesn't have to waste time installing software and the sound card. Intelix's AVO-A2-WP-F wallplate balun distributes a high-fidelity stereo audio signal up to 2,500 feet over standard twisted pair cable, such as Cat-5 or Cat-6. The front panel of the AVO-A2-WP-F features two gold-plated female RCA connectors on a white decora face-plate. The rear panel features an RJ45 connector and optional grounding screw. The installed unit fits in a standard depth wall-box. Used in pairs or with a rack-mountable Intelix AVO-A2 modular balun, the AVO-A2-WP-F transmits 20 Hz to 20 kHz analog audio in either direction up to 2,500 feet.